If you’re using the camera and photo apps that come loaded on your smartphone, you’re not getting the most out of your camera. Specialized apps take better shots in low light, let you easily edit together the perfect group shot, serve up tons of filters and frames and provide advanced editing tools you’ll find in some of the best desktop software packages. And if you take lots of shots, there are apps to help you organize them. So be sure to load up on these photo apps for iOS and Android devices. This small investment will make a big difference in the quality of your pictures. With more than 1.5 million downloads and a 4.5 star rating, this one is a good bet. It lets you customize your phone’s hardware and do things like use volume buttons to zoom. You can also adjust settings such as ISO, focus metering, brightness, saturation and more as well as upload images to social media networks with one click. Other perks include a timer, time lapse, a collage feature not to mention voice activation that lets you snap a photo by clapping or otherwise making noise. Not only does this full-featured iPhone app give you dozens of effects and borders with which to spruce up photos, it offers a couple of unique features, such as the ability to set exposure separately from focus using a second finger as well as the option of using the iPhone flash as a fill light. It comes with a stabilizer for sharp photos, a grid that helps you eliminate crooked shots and a 6x digital zoom. Camera+ also offers scene modes including Backlit, Sunset, Night, Portrait, Beach and more. Does not support HDR photography. Camera Awesome, which was created by SmugMug, is also a good choice. It has many of the same features as Camera+, but also offers guides to help you take better photos. *One caveat: While this is technically a free app, you can only get to some features by making in-app purchases. Full functionality will cost you $9.99. Does not support HDR photography. Taking group photos can be tricky if your goal is to get one where everyone looks good. GroupShot is a wonder because it lets you indicate which parts of a photo you don’t like—say someone’s closed eyes or unsmiling mouth—and it will swap that part out for the same areas on different photos saved on your device. 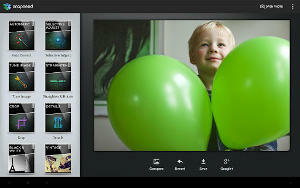 Slow Shutter Cam combines capture options with in-app image editing. It meshes several images to optimize your final output and lets you choose the amount of exposure before you export the image. 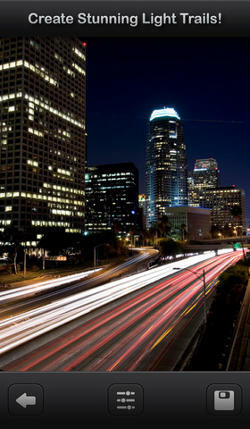 There are three capture modes: Automatic, Manual and Light Trail, with the latter allowing you to paint with light and capture moving light--such as car lights on roadways or fireworks. Other features include real-time live preview, full resolution, freeze control, selectable shutter speeds, exposure compensation, exposure lock and a self-timer. As far as quick capture goes, no app can beat Night Cap. This app’s auto settings are great for most low-light situations and its manual exposure settings can be set to be as slow as one second. Within the capture screen, you can lock the white balance, exposure and focus. While it excels as a nighttime photo app, Night Cap can be used in full-light situations as well. Unlike the other apps that I tested, Night Cap automatically processes your photo as soon as it captures it. There is no mandatory editing step in the photography process. As soon as your photo is finished saving, you can move forward to taking the next photo. While I wouldn’t agree with the developer who says you can use this app “no matter how dark it is,” it does a great job for low light conditions. Take a look at the difference between using my regular camera app to snap a photo of this wood burning stove in my basement (I need one for a proper Craigslist ad), compared with how it turned out with Night Camera+. To use it, you tap your screen, the app tells you to “Hold still!” while it captures 8 frames. After doing so, the app—which gets a better image from the camera sensor than Android’s standard camera app—decodes and processes them to reduce blur and improve dynamic range. You can either save the image or delete it, and if you wait more than a few seconds the app defaults to save. In short, it’s easy to use and works well for a pittance. 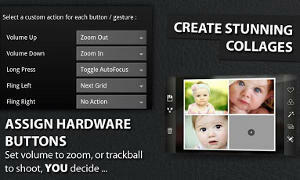 Anyone who’s serious about photography will love this app because it allows your mobile camera to operate like a DSLR. Not only does it let you adjust things such as exposure compensation, ISO, light metering mode, focus mode and white balance, it lets you use long exposures as well as create time lapses. 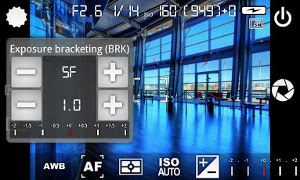 While it has basic features that you can get with simpler photo apps, such as a self-timer and the ability to assign camera functions to the volume keys, Camera FV-5 is a robust and deep app that will likely take time to thoroughly appreciate. Once you figure out everything you can do with it, your $4 purchase will seem like a steal. This app has been called “possibly the best iPad photo editing app” but it works on iPhones and iPod touches, as well. Load a photo from your camera roll into it and you’ll see several icons at the bottom of your screen that let you access different editing features involving things such as special effects, image adjustments, metadata, cropping and history. While it lets you edit images at full resolution—down to the individual pixel—perhaps the best thing PhotoForge2 offers is Layers so you can choose various blending modes, tweak opacity and input layer masks. While it comes with a lot of built-in effects, you can also opt for the $2 in-app purchase of Pop!Cam, which gives you a whole new set of them including more films, filters, frames and grungy paper backgrounds. It also lets you easily upload photos to Dropbox, Facebook, Twitter, Flickr and Picasa. This is a good basic editor that’s a snap to use. After choosing a photo saved on your phone, there are four icons on the top of your screen. One lets you crop, straighten, rotate or flip an image. 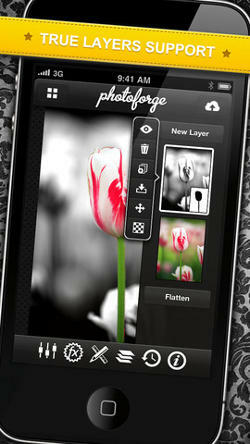 The second lets you adjust exposure, saturation, tint, black and white, contrast and brightness. The third is for soft focus and the fourth is where you can play around with effects and borders. While Photoshop Express only comes with seven built-in effects, a couple of them are simply great, such as Vignette Blur which keeps the center of the photo in focus and blurs the rest, as well as Pop, which repeats your image four times in the frame, giving each one a different tint. iOS users can make in-app purchases from $1 to $5 for more effects, borders and features. 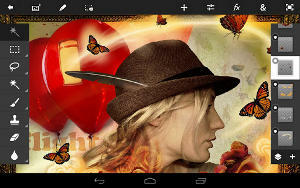 On both Android and iOS you can upload your edited images to Photoshop.com, Facebook and TwitPic. While this one is expensive as apps go, it’s a Techlicious favorite. 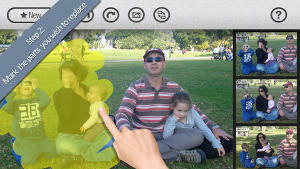 Designed for use on tablets, it lets you mesh images, apply effects and share creations on Facebook and Twitter. Where it stands apart from other photo editing apps is in bringing popular Photoshop features to the tablet—things like layers, selection tools, adjustments and filters. Other cool aspects: A camera fill feature lets you use your tablet camera to fill a layer; Scribble selection lets you select part of an image—even difficult things like hair—by scribbling on it; and tutorials help you used advanced features. Adobe Photoshop Touch supports images up to 12 megapixels, includes Google Image Search and comes with free membership in Adobe’s Creative Cloud, where you get 2GB of cloud storage. Since this one comes from Apple itself, it's predictively intuitive and easy to navigate. By tapping and swiping you can automatically find similar photos, compare them side by side, as well as flag and tag them. Want to vanquish red-eye, fix a blemish or soften wrinkles? Just select on the parts of the image you want to change and use brushes to make the repairs. You can also make color corrections, straighten photos with automatic horizon detection and apply dozens of effects to turn your pics into sketches, watercolors, black and whites and more. And thanks to iCloud you can publish collections as photo journals and share links to them on Facebook, Twitter or via Apple Messages. One caveat: Older devices can't join the fun--iPhoto only runs on iPad 2, iPhone 4 and the 4th generation iPod touch, as well as newer versions of those devices. Snapseed lets you make a myriad of changes to a photo but uses a unique and visually clean interface. After taking a photo or choosing one from your phone’s gallery, you can pick from 13 icons on the bottom of the screen. As examples, one is called like Automatic and lets you adjust color or contrast; another titled Tune Image is for adjusting brightness, ambiance, saturation and white balance. All sorts of edits can be made using these icons but to drill into various features you need to swipe your finger up and down the screen to pick one. To increase or lessen the degree of a change you swipe left and right. Of the several effects you can use in Snapseed I most appreciate Center Focus in which you use your finger to drag a blue dot to the area of your photo you want in focus. Not only can you choose the degree of blur to apply, you can also brighten either the focused area or the blurred area. Like many other photo apps this one lets you apply effects that make average photos look interesting, as well as do things like sharpen, remove red eye, crop, straighten and distort. But where PicSay PRO really shines is as fun way to swap out a person’s head with the photo of a donkey, for example, through a feature that lets you insert cutouts of other pictures. You can also paint, choose an area in a black and white to colorize as well as add text and word balloons. In addition to using it on your Android smartphone it works on tablets such as the Motorola Xoom, Samsung Galaxy Tab, Asus Eee Pad Transformer, and others. 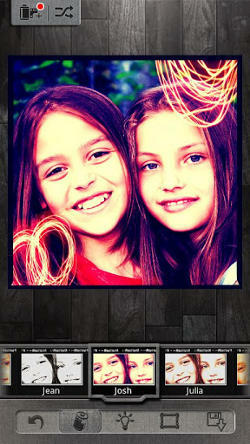 Pixlr-o-matic is different because it comes with more than 100 effects, 280 overlays and nearly 200 different borders. That means after taking a photo or grabbing one already stored on your phone you have countless ways to edit it with combinations of these visual add-ons. The overlays are particularly unique—imagine adding glitter, blurry city lights or other graphic elements to your pics. The way Pixlr-o-matic saves a copy of the last image you were editing on its home screen is another useful feature. And not only can you choose to save your masterpieces as small, medium or original sizes, you can share them with others via nearly 20 mechanisms, including Facebook, Google+, Instagram and more. This is another app with a plethora of filter choices, all organized into categories including Lomo, Vintage, Simple tone, Old Style, Summer mood and Art. You also get 40 effects as well as the ability to turn your photos into sketches, combine multiple photos using frame templates and create vignettes with a Lens Boost effect. It also comes with season-specific frames in case you’re in the mood for Christmas or other holidays. You can also lock the application with a passcode, export and import photos to and from your computer as well as upload your files to Facebook. Note: There’s a separate iPad app in the iTunes Store and it’s also $1.99. This photo and video organizer for Android makes it easier to stay current on cataloging your files because, again, you can do it right on your device instead of waiting to do it on your computer. Features include delete guard and undelete, side-by-side image comparison, one-step resize and share, the ability to add notes to albums and photos, a custom wallpaper editor and a locker to hide and protect your files. It also works with SD cards. Whether you want to take better pictures, add more effects, or just organize them all, we hope you found an app here that suits your needs. If you know of any helpful photo app we've missed, let us know in the comments. 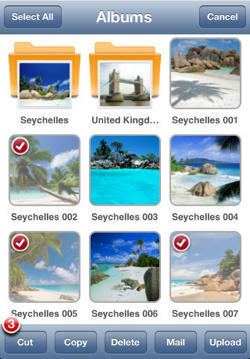 Our app aiCam allows you to create albums right from the camera. It eliminates the need of post processing of large camera rolls. I am sure you will find our app quite useful.